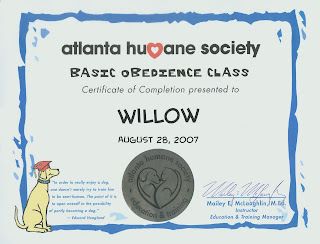 Congratulations, Willow!! Did Eddie give a party for you? Yes, she partied down on a can of Alpo that had gravy and chunks of meat - unlike her normal diet dry food. She passed all her requirement with flying colors and even yawned while doing the "sit!" command. Yes, she already had too much 'Dogma'. She has been trying to train me to "fetch" since she arrived. You are right - as in "step & fetchit"!